Be sure that the water source is damp but not dripping. Water droplets will endanger the ladybugs. Ladybugs (also known as ladybirds and lady beetles) are seen in some cultures as a sign of good luck. These peaceful little beetles are less than a 1/4-inch long and are usually red with black spots or black with red spots. 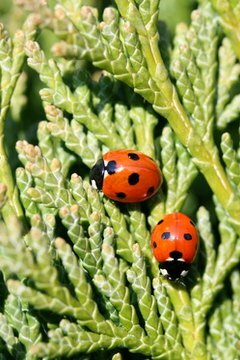 Ladybugs are welcome in any garden because they feast on destructive pests such as aphids, mites and mealy bugs. It can be difficult to keep insects alive indoors, but ladybugs are resilient and there are ways to keep them inside with special care. Set up a bug box or terrarium to house the ladybugs. Line the bottom of the box or terrarium with shredded paper. Add folded pieces of cardboard for the bugs to crawl on. Place some small limbs of foliage throughout the ladybug enclosure. Dampen a folded paper towel and place in the ladybug house. A clean, dampened sponge will also work to provide a water source for the beetles. Feed the ladybugs. Aphids are the preferred diet for ladybugs and are sometimes commercially available. If you plan long-term indoor care of ladybugs, you will have to find a way to provide them with aphids to eat daily. Wipe wheast on sticks and place in ladybug enclosure. Wheast is a food supplement that can be purchased or easily made at home. To make homemade wheast, mix equal parts of yeast, honey or sugar and water. Paint thicker wheast paste on wooden sticks or dilute with water and spray on foliage. Dampen raisins and place in bottom of the ladybug enclosure. Lady bugs will sometimes eat raisins and other sweet, non-acidic fruits.